Anti-Israel activists at the University of California, Davis heckled Jewish students and shouted "Allahhu Akbar" at them during a vote last week on a resolution endorsing a boycott of the Jewish state, according to video of the event obtained by the Washington Free Beacon. The commotion erupted late Thursday evening as pro-Israel students attempted to counter a student government resolution to divest from Israel as part of the Boycott, Divestment, and Sanctions (BDS) movement. 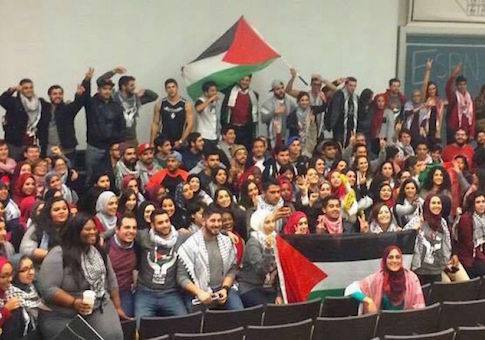 Activists waving Palestinian flags shouted at the Jewish and pro-Israel students as they left the meeting room ahead of an eight to two vote in favor of the divestment resolution, which is part of a larger movement by anti-Israel groups to attack Israel and pro-Israel students on campus. "Allahhu Akhbar!" a large group of activists shouted in unison as the pro-Israel students filed out of U.C. Davis’ meeting room, according to video provided by a member of Aggies for Israel, a pro-Israel student group at Davis. Following the vote, which was championed by the pro-Hamas group Students for Justice in Palestine (SJP), unknown vandals spray-painted swastikas on a fraternity house belonging to the Jewish AEPi organization. Additionally, Azka Fayyaz, a member of the U.C. 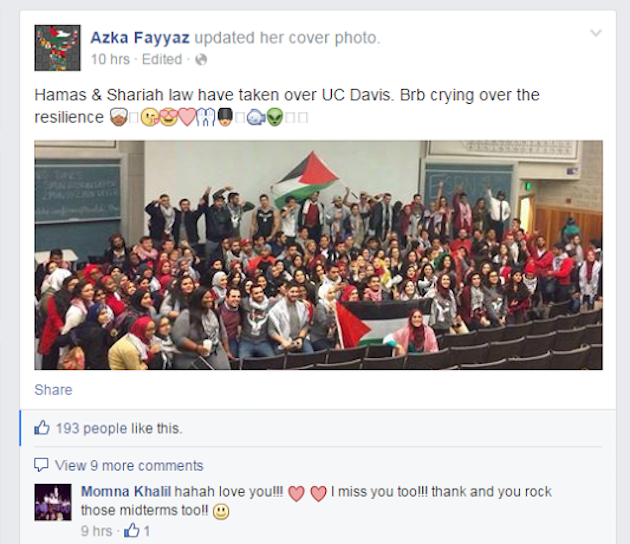 Davis student senate, posted on her Facebook page a triumphant message following the vote: "Hamas & Sharia law have taken over UC Davis." Fayyaz followed this with another post stating: "If a movement is not controversial, if no one is mad, its [sic] not strong enough & it's not worth the fight. Israel will fall insha'Allah." Pro-Israel activists involved in the battle said the series of events at U.C. Davis highlight the danger posed to campuses by the BDS movement. "BDS activism, anti-Semitism, swastikas, celebration of terror—these things are found together," said Noah Pollak, executive director of the Emergency Committee for Israel. "The U.C. Davis administration should be deeply alarmed that a member of the student senate has openly endorsed Hamas, a U.S.-designated terrorist organization whose charter calls for the murder of Jews worldwide." 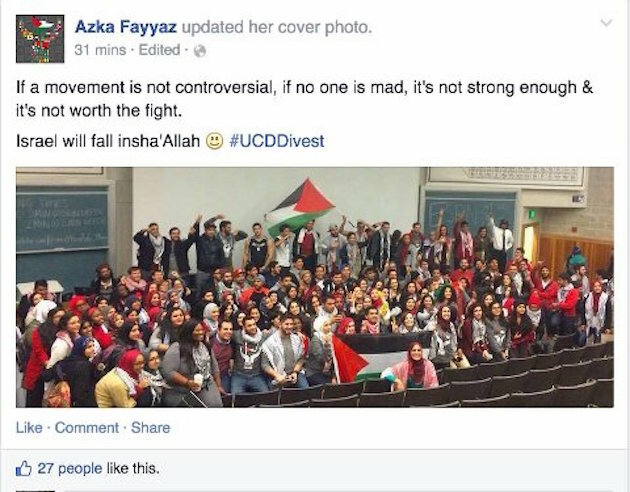 Johanna Wilder, a StandWithUs Pacific Northwest campus coordinator, said that the Facebook postings by student senator Fayyaz highlight SJP’s ongoing promotion of hatred. "This demonstrates the dishonesty and hypocrisy of divestment campaigns on campus," Wilder said in a statement following the vote. "They claim to be about social justice and human rights, but this student senator's statement revealed SJP and the BDS movement's real agenda." "A racist group, Hamas is designated a terror organization by the U.S. and many other governments and its charter is sworn to the destruction of the state of Israel," she said. Members of the AEPi fraternity also took note of the proximity between the BDS vote and the defacement of their home. "Our U.C. Davis AEPi fraternity house was tagged with two swastikas, coming 24 hours after the deeply troubling actions on campus coming from those seeking to delegitimize Israel and her people," a group of AEPi leaders and alumni members said in a joint statement released after the anti-Semitic attack. U.C. Davis leaders said the administration fully opposes divestment from Israel. Last weeks’ vote "does not reflect the position of U.C. Davis or the University of California system," U.C. Davis Chancellor Linda P.B. Katehi said in a statement. "The investment policy for the University of California system, including U.C. Davis, is set by the U.C. Board of Regents." "The Board and Office of the President issued a statement regarding student resolutions that urge the Board to divest from companies doing business with Israel," Katehi said. "The statement reiterates the Board’s position that this type of call to action will not be entertained." When asked about the controversial comments made by the student senator, a U.C. Davis spokesman said, "statements by individuals do not reflect a position of the university or the university community as a whole … U.C. Davis is built on a foundation of tolerance and inclusion, and we have an obligation to treat each other with respect and dignity even when we disagree." He said Davis police are investigating the vandalism incident at AEPi. "U.C. Davis Student Affairs and U.C. Davis police have met with the fraternity to offer support and advice," the spokesman said. "It is being investigated as a hate crime. This entry was posted in Issues and tagged Anti-Semitism, Hamas, Israel. Bookmark the permalink.